Biomarkers are measures of what is happening inside the living body, shown by the results of laboratory and imaging tests. Some examples are elevated PSA levels, which may indicate prostate cancer, and elevated blood pressure readings, which may indicate high blood pressure. These measurable substances help us diagnose disease, create individualized treatment plans, and ultimately, develop standards for evaluating the effectiveness of treatments. They are the signposts that guide our long and complicated journey toward finding medications, preventive strategies, and cures for Alzheimer’s disease. What are Biomarkers of Alzheimer's Disease? Research into biomarkers for Alzheimer’s disease is an important focal point of the ADRC’s past and current research and exploration. Biomarkers are measurable markers in the blood, spinal fluid, levels of amyloid or tau pathology in the brain, patterns of brain activity on functional MRI or PET scan, or scores on cognitive tests. Our research aims to identify specific biomarkers that definitively indicate whether people have Alzheimer’s disease or whether they may be at risk of developing dementia sometime in the future. We hope that by identifying biomarkers for Alzheimer’s disease we will be able to accurately tailor Alzheimer’s treatments and recognize people who may be good candidates for prevention treatments-the hallmark of a precision medicine approach. Tracking changes in biomarkers over time can help researchers to monitor a disease’s path through the brain, or the effect of a therapeutic during a clinical trial. Magnetic resonance imaging (MRI) uses magnetic fields and radio waves to produce detailed images of body structures, including the size and shape of the brain and brain regions. MRI may be able to identify some causes of dementia symptoms, such as a tumor, stroke, or head injury. MRI may also show whether areas of the brain have atrophied. Our team runs the Therapeutic Pipeline Project's Dynamic Functional Connectivity MRI in Preclinical AD, an imaging study led by Drs. Tom Grabowski and Tara Madhyastha. They aim to evaluate the potential of MRI and amyloid PET scans- images of brain structure and activity- to serve as a tool of diagnosis or to track disease progression. 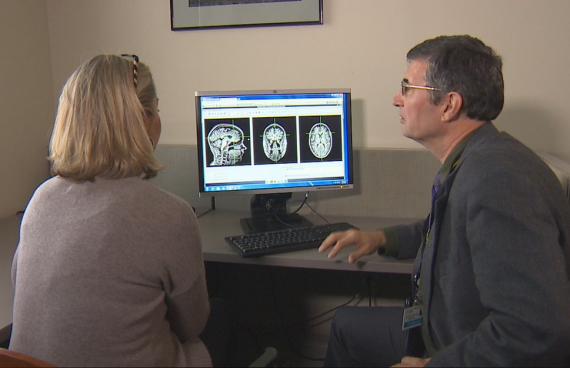 A recent new tool in biomarker research at the UW is tau imaging - a method of positron emission tomography PET scanning that reveals the pattern of accumulation of tau (a pathology present in several neurodegenerative diseases) in the brains of living people. Tau imaging is poised to have huge implications for understanding and diagnosing FTD and Alzheimer disease and monitoring the effectiveness of drugs targeting tau. For in-depth information on biomarkers and their value to dementia research and treatment, please read the NIA publication, Biomarkers for Dementia Detection and Research, now available in print and online. This 8-page fact sheet summarizes types of biomarkers and tests, what they are, and how they’re used. Read the NIA’s ADEAR Center's Biomarkers for Dementia Detection and Research, available in print and online. This 8-page fact sheet summarizes types of biomarkers and tests, what they are, and how they’re used. It’s the perfect source of information for clinical research volunteers and potential participants.